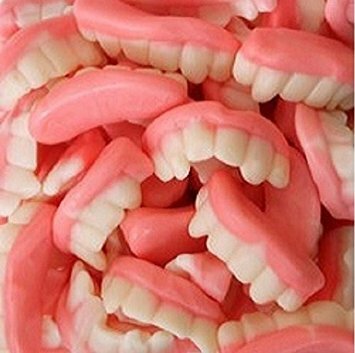 Sink your teeth into these teeth. A familiar classic. Ingredients: Glucose Syrup (Wheat), Sugar, Starch (Wheat), Water, Gelatine, Food Acid (Citric Acid), Flavours, Colours (110, 122, 124). May contain Peanuts, Tree Nuts, Egg and Milk products.